This is the full size version. For further zooming, use your browser’s zoom feature (eg CTRL +) or your favorite image editor. In the charts in this post, cameras with prices going up have a red plus next to their price, while cameras with prices going down have a red minus next to their price. Steady or stagnating are the prices otherwise among the non-entry-level models. The Sigma SD1 price jump is because the retailer that had it for $1800 (Adorama) no longer carriers the body only. 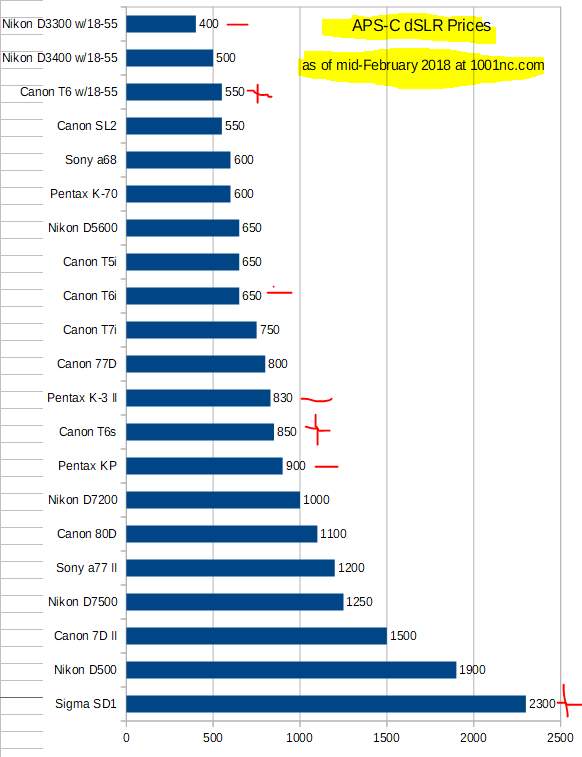 Pentax was the only one who gave their cameras some discounting, the KP dropped by $100 and the K3 II by $20. The effects of essentially manufacturer price control in full bloom. 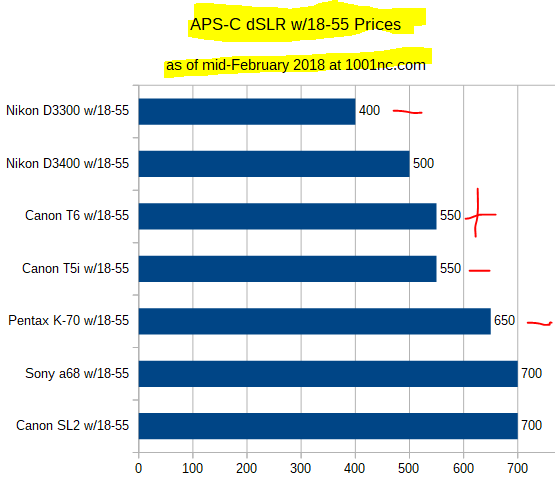 All three of Sony’s DSLRs continues, two APS-C here (a68, a77 II) and one full framer [that’s in the Full Frame Price Chart]. The Canon price increases have also tilted the prices of the “Take Pictures With” updates, and the number of choices has decreased as we lost Nikon D5300 and Pentax K-S2 due to old age, while the D-Rebel T6i w/18-55 climbed over $700 which is our cut-off point. From the prices above, someone looking for their first entry-point DSLR is probably better served looking at manufacturer refurbished or used or grey market cameras. It is hard to justify paying those prices for older and aging DSLRs. The prices are the consensus prices between Amazon and B&H Photo and Adorama as of February 21 in 2018. These are new condition with USA warranty prices, from authorized dealers. All the prices are the body only kit prices. Older cameras that are no longer available in new condition with USA warranty from the above retailers, or are available in a very limited fashion, are not included.